When it comes to Christmas, Santa Claus is perhaps the most prominent figure. His red and whites dot all areas of our lives and his jolly spirit defines the heart of the season. It may, however, come as a shock that Santa was not always decked out in red and white although his cheer has always been part of the legend. Red and white have come to define Santa Claus so much that it is hard to imagine the character of the man who emanated from the historical figure Saint Nicholas, without them. Saint Nicholas was a Bishop who lived in the fourth century in a place called Myra in Asia Minor (now called Turkey). He was a very rich man because his parents had left him a large amount of money at their death. He was also so kind that he used most of that money to help people rather than for his own personal enjoyment. On that note, they would receive secret gifts from him and he eventually was made a Saint based on his generosity. How Did The Red Santa Claus Come To Be? So what do red and white have to do with generosity? Some historians have looked at the clothing of the saints during the early centuries. All that research has turned up the fact that in the 4th century when Saint Nicholas existed, the robes of Saints were red and white. It seems like an easy connection to make therefore as to the reason why Santa Claus dons red and white. A further history lesson will show, however, that in the 16th century when Santa Claus was introduced to the UK as the figure of the Christmas season, he was decked out in green rather than red. In 1862, Thomas Nast, a popular American cartoonist, drew a picture of Santa for Harper’s Weekly magazine, the original pictures featured Santa in a tan outfit but that transformed over the years to red. The Santa that we know today was first created for an advertising campaign by Coca-Cola. The Coca-Cola Company had begun its Christmas advertising in the 1920s with shopping-related ads in magazines like The Saturday Evening Post. The first Santa ads used a strict-looking Claus, in the vein of Thomas Nast. In 1931 the company began placing Coca-Cola ads in popular magazines. 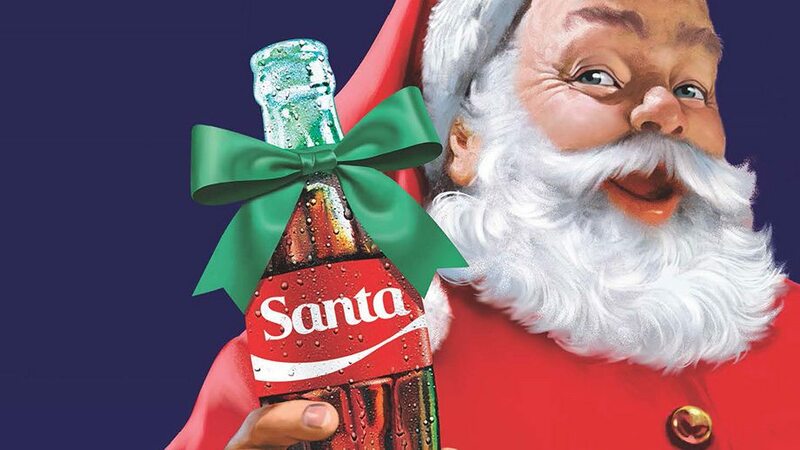 Archie Lee, the D’Arcy Advertising Agency executive working with The Coca-Cola Company, wanted the campaign to show a wholesome Santa who was both realistic and symbolic. So Coca-Cola commissioned Michigan-born illustrator Haddon Sundblom to develop advertising images using Santa Claus showing Santa himself, not a man dressed as Santa. The inspiration for Sundblom came in the form of an 1822 poem ‘Twas the Night Before Christmas’ by Clement Clark Moore. The poem saw Santa described as jolly and plump, with rosy cheeks, twinkling eyes and dimples. Sundblom then took inspiration for his clothing from the robes of Saints and the works of Thomas Nash, which showed a red coat before the end of the 19th Century. It was until 1964 before Sundblom stopped illustrating Santa Claus but Coca-Cola never missed a chance in this season to utilize this loved Christmas character to advertise their popular drinks. So, Haddon Sundblom is the man who is credited with the creation of the Santa we know today. As Europe became Christianized, the figure of Santa Claus appropriated several pagan elements, including the narrative of the god Odin, who sported a long white beard and rode a massive warhorse with eight legs. Santa’s list of “naughty” and “nice” children originated from Belgium and the Netherlands where their version of Santa Claus, Sinterklaas, kept a similar list. In the Santa Claus narrative, naughty children most likely receive coal as a matter of convenience. According to French tradition, Santa Claus has a helper who also happens to be a cannibal. As punishment for eating children, Father Christmas forced Père Fouettard (aka Father Whipper) to become his assistant and beat naughty children with sticks.